Added on Thu, 24 Sep 2009 16:41:58 -0700. Hey, hey, hey, children! It's time for more film updates from the depths of the Capital Wastelands, as we take a break from obsessing over Fallout 3 to bring you our views on District 9, (500) Days of Summer, Funny People and The Hurt Locker. Not a bad bunch of films, if we do say so ourselves. 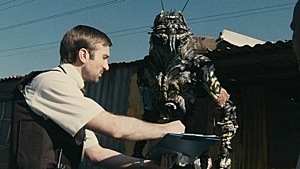 Hype abounds for District 9, a film which we like, but perhaps not as much as the abundant hype would warrant. A mix of pseudo-documentarian looks at the unusual refugee situation caused when an alien spacecraft grinds to a halt over South Africa and an all-out action, balls-to-the-wall blockbuster, both of these halves are well done but barely integrated at all. The race relations themes it threatened to bring are very much a smokescreen for the mayhem that follows, but that's no barrier for entertainment. The irritatingly titled (500) Days of Summer is an attempt at building a slightly off-kilter rom-com, although in the final analysis it's still a film about love affairs gone wrong that cannot escape the fact that it's the umpteen millionth film out love gone wrong. Zooey Deschanel continues to be somewhat irritating and unlikable, which makes it difficult to care much about the characters and their heartbreaks. Which is a problem for a rom-com. By no means dreadful, or even mediocre for that matter, but the weakest of the films we talk about this time round. Funny People marks, I reckon, a new maturity for Judd Apatow as he directs a film with far more nuance and depth than his previous out-and-out laugh riots. Adam Sandler sees himself playing a successful, but damaged comic diagnosed with a life threatening illness, forming a friendship with relative youngster Seth Rogen. This doesn't go for the comic jugular as per most of the other Apatow outings, instead showing a good sense of occasionally touching drama and a great performance from Sandler, rivalling his turn in Punch Drunk Love. One of the year's best, I think. Rounding things off this time is The Hurt Locker, a tension-packed tale of US Army bomb disposal experts in Iraq. With a new, seemingly recklessly gung-ho but experienced and excellent new specialist joining a more by-the-book team, bringing personality conflicts into situations already tension-cranked to the extremes. Intelligently crafted, a rarity these days, and certainly worthy of your time. Another one of the year's best, we reckon.